The latest release in Stone's Anniversary series is what they are calling "The hoppiest golden brown IPA on Earth". It's an imperial IPA brewed exclusively with El Dorado hops along with English brown malts. Pours a dark amber, almost burgundy color with a finger's worth of an off-white, khaki head. A huge aroma of dark malts up front, almost nutty like an English brown ale. Then after that it is a dry, floral scent that reminds you of fresh potpourri. Some nice, bitter, fresh hops and lemon zest too. Smells excellent! The taste has an abundance of dank, garlic flavor combined with an underlying citrus note. Much like the aroma, there are big floral components with what I can only describe as a mossy, wet grass taste - very earthy indeed. As hoppy as it is, those English malts are just as present, maybe even more, making for a nice brown ale feel to go hand-in-hand with the hoppy IPA. The malts and huge earthy/floral hops don't exactly make this an easy-drinking experience, but there's no alcohol taste or warming sensation for a big 8.5% IPA. In fact, those who like brown ales will enjoy this beer. This was a pleasant surprise from Stone. 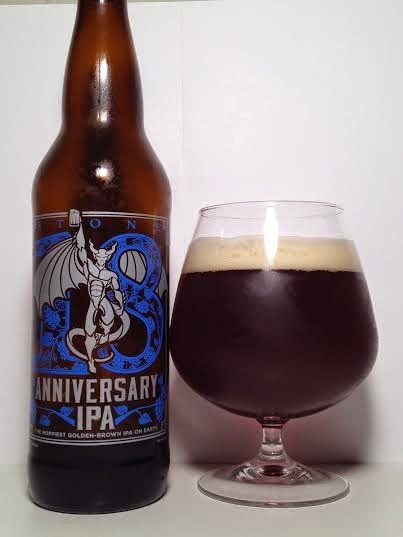 While I can't say this will be accepted by all (especially if brown ales and HUGE grassy/herbal hops aren't your thing), the 18th Anniversary offering is one of the best in recent memory. Very flavorful and different, but it works.